Often times, primary classroom teachers like to use the seasons as a monthly guide for their instruction. In my Music teaching experience, I find it easier to teach my units this way in the elementary grades as well. 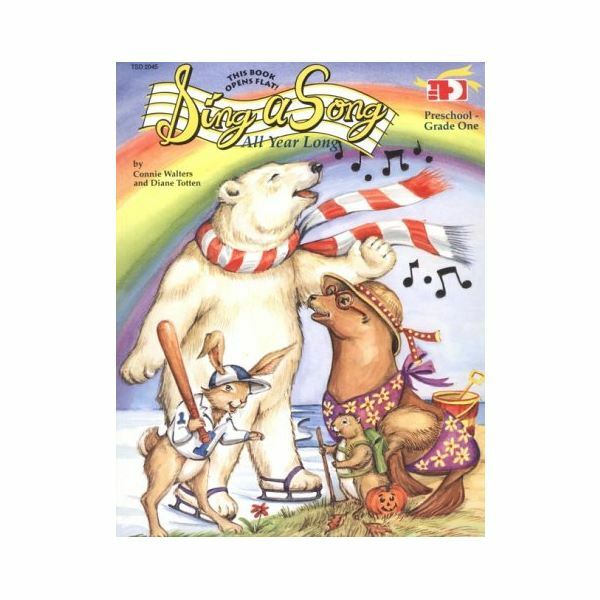 The book Sing a Song All Year Long merges season songs in classroom lessons and incorporates other academic activities into monthly themes as well. Your students will love participating in these classroom songs and activities all year long, guaranteed. This book is a collection of over 100 monthly thematic classroom songs for preschool children and up (through grade one preferably). It also includes classroom games, paper puppets, patterns for flannelboard activities, and craft ideas that are all connected to a particular month or theme as well. This elementary Music resource has a dual purpose. It encourages children to sing which is enjoyable for them, while reinforcing lessons previously taught or introducing new ones into the classroom. As stated in the introduction of the book, "…the suggested activities will involve children in a "doing" process, which will further strengthen their learning." Many of the songs and activities are connected to a theme which can be seasonal or unit-based, but many of them can be used year round. A table of contents – The content is listed by months of the school year and also has a section for summer months and sheet music. Under each month, there are themes that are touched on in that section. For example, for September, the themes covered are: Getting Ready for School, Apples, Squirrels, and The Coming of Fall. A title page for each month – Provides a list of songs that are included in that section. Classroom songs, activities and reproducible patterns – In each section, there are songs with familiar melodies for ease of learning for young students. There are also patterns that you can reproduce and cut out to make paper puppets and other crafts and games as well. These reinforce certain areas such as language development, cooking, reading, art, science, drama, math, movement and of course music. Sheet Music – At the back of the book, there is sheet music provided for each tune that includes the melody and chords for teacher accompaniment. One thing I love about this book that differs from other classroom song books, is that the sheet music is provided. This is great for teachers who unfamiliar with some of the tunes to be able to play the accompaniment themselves or ask their Music teacher to possibly record the songs for them. This will also help your students' vocal and listening skills. I also love how the visuals in this book are very clear and easy to see and cut. This makes it easier for those students who struggle with cutting and coloring. Some of the language ideas and cognitive sequencing ideas are fantastic as well. I love how this book is organized by month. It makes organizing your unit plans much more feasible. In addition, as a Music teacher, I am partial to the season songs as well. I always find it easier to teach to the seasons and holidays and then I incorporate academics as well. The one thing I found I didn't like about this book was the fact that it was missing an index. It is a little time-consuming to find a specific song when you are in a time crunch, but other then that, this elementary Music resource is a keeper! As a whole, this book contains a lot of useful classroom songs and teaching materials that all of your students will enjoy. Sing a Song All Year Long is a great Music resource to add to your shelves.